Becoming a parent for the first time can be incredibly daunting. There are so many things to think about and even more things to purchase to ensure the comfort of your little one once he or she arrives. Are absolutely all of those baby furniture pieces and accessories really necessary though? We’ve compiled a list of the definite must-haves to narrow it down for you and simplify your life. A Cradle or a Cot? Surprisingly, both are actually necessary. For the first six months of your baby’s life, paediatricians recommend that your little one sleeps next to you for close monitoring. This doesn’t mean that they have to share a bed with you and this is where a cradle comes in handy. 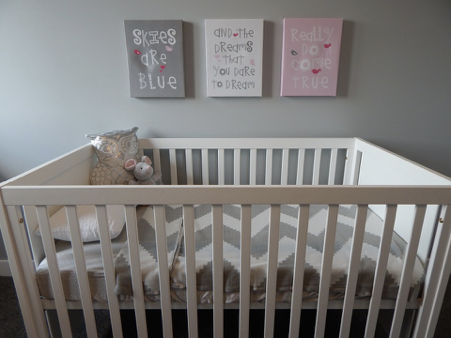 A cradle can be placed next to your bed, is sturdy and will last longer than a bassinet in the sense that your baby won’t outgrow it as quickly. Once your baby has passed the six-month milestone, sleeping in their own room is a recommended option. A cot or crib is crucial for this phase as a specially designed children’s bed with latticed sides that keeps your baby safe. For the times where it becomes difficult to get your baby to sleep, the space in a cot allows for plenty of blankets, toys and a mobile to create distractions until your little one feels tired. Cots are a great investment as well because your baby won’t simply outgrow them in a matter of months. A compactum is a set of shelves where nappies, wet wipes, towels and baby toiletries can be kept. Its surface is designed to fit a changing mat so that you can change your baby’s nappy easily with all the things you may need being close by and easily accessible. This is definitely a nursery room must-have! Bedding, a dustbin, baby bibs and baskets are also essential for a nursery room. Don’t forget toys as well as shelving for décor items, baby monitors and other things you choose to put in your nursery. For incredible baby bedroom furniture, contact The Room or visit their website. Life is unpredictable and if yours is as unpredictable as mine, that can mean the arrival of a guest on the spur of the moment. Cue the panic as I scramble to move the make-shift office space I’ve somehow created in the ‘guest bedroom’ over the past year. Could there be a way around this dilemma? A Quick Conversion If, like me, you have guests about once or twice a year, then you can see how it makes little sense to have a guest room taking up valuable space that could be used for another purpose for the rest of that year. With a little innovation, one room could be used as a workspace as well as easily and effortlessly converted into a comfortable and inviting guest room. Furniture Design for Versatile Functionality Implementing this concept requires a serious evaluation of the type of furniture you decide to use in that room. There are ways to assimilate bedroom furniture with office furniture and make it look like it isn’t so. A day bed is an absolute must-have because of the versatility it affords – easily made to look like a couch in an office space or done up to look like one of the most important elements in a guest bedroom (duh, a bed). If selected cleverly enough, a desk can also become a dressing table – insert mirror and there you have it. Accessorize for a Purpose Great bedding design goes a long way to ensure a day bed looks like its sole function is to accommodate comfortable guests while they sleep. Fresh flowers are a must for any guest room or any office space for that matter. For more ideas on furniture that can have dual functions and make your life a whole lot easier, contact The Room or visit their website. If you want, our supervisors also give you an opportunity to determine a professional on your very own. Consequently, for the convenience, you have got an exceptional opportunity to monitor the growth associated with assigned writer and also make yes an essay is likely to be prepared in a way that is timely. As a problem of reality, whenever looking for you to definitely form my essay, you obtain a good risk of experiencing an English professor looking for a buck that is quick.